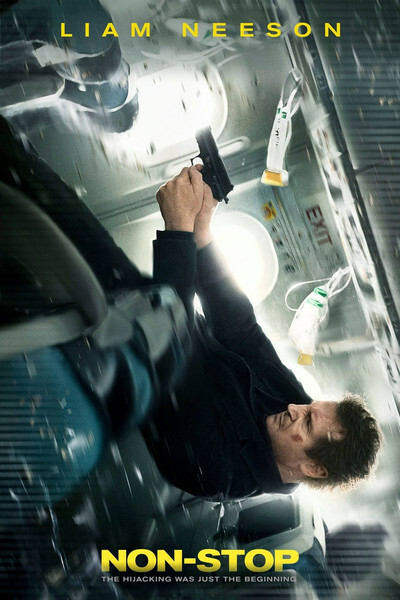 If "Non-Stop" proves anything, besides confirming that 61-year-old Liam Neeson is not going to be knocked off his perch as the elder statesman of B-movie tough guys any time soon, it’s that snakes on a plane have nothing on texts on a plane when it comes to in-flight annoyances. If I wanted to read my way through a film that features words dancing around the screen as if they were waltzing Post-Its, I would have sat through a foreign movie with subtitles instead. But what would modern-day thrillers be these days without cell phones as a shorthand way to advance the plot and reduce the need for any actual clever repartee between characters? Especially when the clock is ticking down the minutes until something either goes boo or boom. Certainly, this mile-high action flick would barely get off the ground without such technological aids, considering its premise is as reliant on Miss Marple mysteries—specifically, the gathering of potential perpetrators who conform to certain types—as it is on digital devices. The rather ingenious if preposterous premise, one that only goes way off course in the heavy-handed third act: Neeson’s burned-out alcoholic air marshal struggles to find the fellow passenger aboard his New York-to-London flight who has sent him anonymous messages threatening that someone on the plane will be killed every 20 minutes until $150 million is deposited in a special account. As most frequent flyers, know there are rules about phone use once you leave the gate. But ignoring such regulations is just one of the reasons "Non-Stop" is so ridiculously entertaining in spite of its occasional lapses in real-world logic. Nicotine addicts might vicariously appreciate how Neeson’s Bill Marks disables the smoke detector in the lavatory—duct tape is the key—so he can puff away while aloft with impunity. Others may be awed by how our grizzled hero takes advantage of the narrow confines of that same bathroom to efficiently pulverize an attacker to death. Director Jaume Collet-Serra and veteran producer Joel Silver ("The Matrix" franchise, "Die Hard" and "Die Hard 2"), who both previously teamed with Neeson on 2011’s "Unknown", happily settle for economy-class storytelling. They know that their not-so-gentle giant of a star will emote just enough to keep the audience satisfied as he forcefully strides through the aisles and shouts orders in his resonant Irish burr. They also know how to humanize him, as Neeson kindly reassures the mandatory unaccompanied minor, a blonde moppet with stuffed animal in tow. They do, however, indulge in upgrades when it comes to the supporting cast—most suspicious characters in their own special way. Many are over-qualified for the assignment, similar to the way stage legend Helen Hayes played a little old lady stowaway in 1970's "Airport". Rest assured none will be winning an Oscar like Hayes did for her ride in the sky, but attaching themselves to the coattails of a late-career box-office titan like Neeson is a reward in itself. Look, there's "Downton Abbey"'s Lady Mary—Michelle Dockery—as the main flight attendant (I kept wishing she would pull a Karen Black and commandeer the cockpit, but there is always the possible sequel). That bald NYPD cop who keeps grousing? Corey Stoll from Netflix's "House of Cards". And isn't that Scoot McNairy of "Argo" as the skinny nervous guy with glasses? And what about four-time Oscar nominee Julianne Moore as an over-stressed businesswoman who is lucky enough to be seated next to a grimacing Neeson? And, speaking of Academy Awards, current supporting actress nominee Lupita Nyong’o of "12 Years a Slave", who spouts barely five lines on camera in a fetching British accent, is Lady Mary's fellow attendant. There is also a Muslim doctor (racial profiling opportunity, naturally) and a nerdy black computer specialist for added diversity. The twist, which is revealed in the trailer, is that the terrorist mastermind behind this stunt has figured out a way to manipulate matters so that Neeson's disgruntled marshal appears to be a hijacker holding everyone hostage. It doesn't help that he keeps waving his gun and roughing up the passengers while increasing the ever-present post-9/11 levels of paranoia. In one of several welcome comic-relief moments, as the passengers appear ready to mutiny against their supposed captor, Neeson suddenly offers everyone free international travel for a year on behalf of the airline. If it saddens anyone that the Oscar-nominated Nazi fighter in "Schindler’s List" is employing his skills as an amateur boxer these days more than his flair for the dramatic to make a living, worry not. Neeson shows he has still got it as the voice of the wee swivel-headed figure known as Bad Cop/Good Cop in "The Lego Movie", a role that allows him to be less plastic than he is in "Non-Stop".